Arriving home last evening about 7PM was thankfully uneventful. The house was in great shape, thanks to our family watching it and Makayla was there to greet us, having been returned from spending three weeks with her cousin Chewbacca a few hours earlier. I missed my dog and it was good to see her. The trip from Florida, nominally a 15 hour drive too 17 hour due to heavy traffic between Richmond, VA, and home. My traffic alert in the car was going off every few minutes to advise me of a new accident or traffic jam. It was torturous to see our arrival time slip from 5PM, to 5:30PM and so on until we finally arrived home when we did. I have got to figure a better way to drive from Richmond to avoid all of the continual traffic nonsense--or plan to drive through during the wee hours or late hours of the day as we do when departing. As they say, it is over, but at least the memories remain (and almost 900 pictures that Chris and I took). I love digital imagery--shoot until you get it right! The new vehicle performed perfectly on the highway. I especially appreciated the internet connection for traffic updates and the detour/rerouting that the navigation system offers. We used that on a couple of occasions yesterday--but then at one point we needed a detour while on the detour. We finally decided to just slog it out on I-95. One of the most memorable things I did during the vacation was build a sand castle with Ethan, Jax, and Chris. 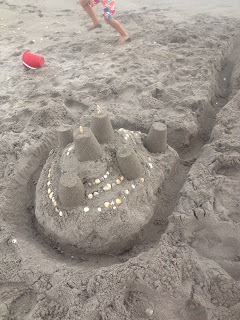 I have not engaged in sand castle building in a number of years, and I have grown a bit rusty. But our creation was significant. I was sad that I did not return to that beach the next day to see how the wind and waves had returned it to sandy beach. We have already mostly decided that we will likely not return to Jupiter next year. but will instead venture off to some other location--maybe not even a beach. But, that is for another day to decide. And the Holiday Weekend Begins!